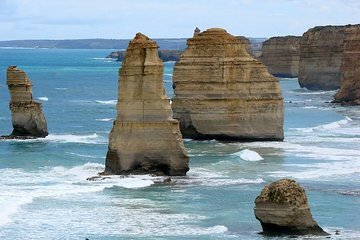 Aproveite os descontos em duas das excursões mais populares de Melbourne - Great Ocean Road e a marcha dos pinguins em Phillip Island - ao reservar este pacote combinado. Passe um dia inteiro aproveitando os destaques e a paisagem espetacular da Great Ocean Road, incluindo os Twelve Apostles e Loch Ard Gorge. Em outro dia de sua escolha, siga para Phillip Island para assistir à marcha dos pequenos pinguins, além de paradas no Koala Conservation Centre e Churchill Island Farm. I signed up for the “Reverse” Great Ocean Tour specifically to arrive at the 12 Apostles first to avoid the crowds. However, 1 hour into the ride, I realized this was the regular route. I will highly recommend this tour to everyone. Buses were on time. Guides /Drivers were excellent. Had great passion and knowledge about this tours. Penguin Parade was truly amazing and beautiful. We enjoyed great ocean Road and Penguin watch. Thank you. Will do this again on our next visit. We will never forget this wonderful city and we will plan to visit and stay longer to see other wonderful places. As a solo traveler, I am always a bit hesitant to join larger group tours, but this combo was amazing! It was the perfect combination of sites and activities that made me feel like I was getting to know the Melbourne region. The timing of each stop and the advice given for how to spend your time was spot on, and I would definitely recommend this experience to others! The tour guides are knowledgeable and kind, and the bus ride was comfortable and scenic. Don't hesitate! The package tour on great ocean road and Phillip island was great and amazing! The commentary by the driver made the trip insightful and there were many stops along the way to keep our cameras and eyes occupied! We were lucky to get grayline for our combo trip. We get a big double decker bus with wifi on our Great Ocean Road. We covered most of the area. As for Philip island, it was a normal tour bus with no wifi. Overall, the trip was worth it and it was cheaper than booking direct with grayline.